Your business website can act as a mainstream for your online marketing and branding. It can be a major source of communication to build a healthy relation with your customers. If you want to be a successful businessman, you need to understand the importance of a business website to your business. There are so many entrepreneurs and small business owners who are not getting the real benefits from their business websites. It is due to some mistakes that they have made with their websites. 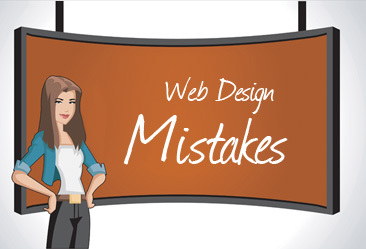 The followings are the common mistakes that you should avoid while creating your website. Your website needs to be an attractive and eye catching layout and design. Choose a unique color scheme with two or three colors and don’t change it for every page and follow the Website Design Checklist to create a successful website. Ensure simple navigation bar and it is easy to use. If your page is long, then also use bottom navigation bar to make your website more user friendly. Mostly, the websites don’t have enough information. It is a big mistake. When people are searching online, they want complete information right there. They don’t have much time to send an E-mail or connect to you on phone to get more details. Remember, if the visitors do not find the information, they are looking for: they will go elsewhere. Trust building is an important thing for online business and many online business owners fail to prove their credibility. Remember, you are competing with millions of websites online, if your website is not trustworthy, your visitors will not convert into buying customers. Add reviews and testimonials of your happy customers; furthermore, add award details that you have won and details about business to build trust. Include relevant keywords and phrase in your content to make your website easily understandable for search engine like Google, yahoo and Bing. Add keywords in your website’s title and headings and also use alt tags in your images. Make sure what you want from visitors to do on your website and also give complete information of all actions that you want from them. If you want a phone call, provide your phone number and also provide trusted source of payments like PayPal, include details of your service provider on your website. Almost ninety-eight percent people won’t buy on their first visit to your website. So, it is important to find a way to track them. It can be via attractive offers like sample/free use of your products and e-newsletters, this way you can get their details. Ask them to join you on different social networks such as Facebook and Twitter. The best way to build a website is to do it from scratch a few times just to get a grasp on how it’s done. And for that we can use softwares..